Congratulations! 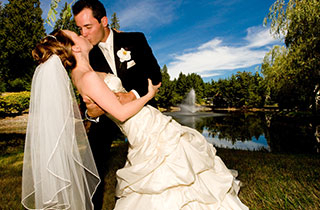 Belamere Suites Hotel is the perfect place to spend the first night of the rest of your lives together. Enter into an inviting, tranquil experience in an intimate, secluded setting. Belamere Suites Hotel specializes in romance. Leave the rain, snow, wind and excess luggage behind as you enter your suite from your attached personal garage. Once inside, the two person shower and oversized whirlpool tub await the beginning of a relaxing, memorable evening. Recline in crisp, clean linens that adorn your king sized bed and enjoy a warm, roaring fireplace. Relax in unrivaled privacy and solitude while connecting with your new spouse. Our concierge service will attend to your every need. Enjoy yourselves and let Belamere Suites Hotel create a memory that will last a lifetime. To add this to your reservation, please choose this option during booking via "Select Optional Package".